What a beautiful color challenge that TGIFC has for you! Who knew Malon Mambo, Mango Melody, Coastal Cabana, and Black went sooooo well together! I would have never paired them on my own, so I am always so excited for a new color combination….especially when the result is amazing! Stamp 7 petals (Pop of Petals Bundle) in Jet Black StazOn. Crop with the coordinating Four-Petal Flower Punch. Snip each one in half. Cut a piece of Shimmery White Cardstock to 3 3/4″ x 5″. Create a watercolor wash background with an Aqua Painter and Mango Melody Ink. Let dry completely. Stamp the “thank you” sentiment from the Love What You Do Stamp Set using Jet Black StazOn. Randomly stamp the fern and leaves from the Pop of Petal stamp set as shown. Flick Basic Black ink onto the cardstock using a Stampin’ Write Marker & End Cap. Add Snail Adhesive around all edges of the Shimmery White Cardstock. Adhere the black petals as shown. 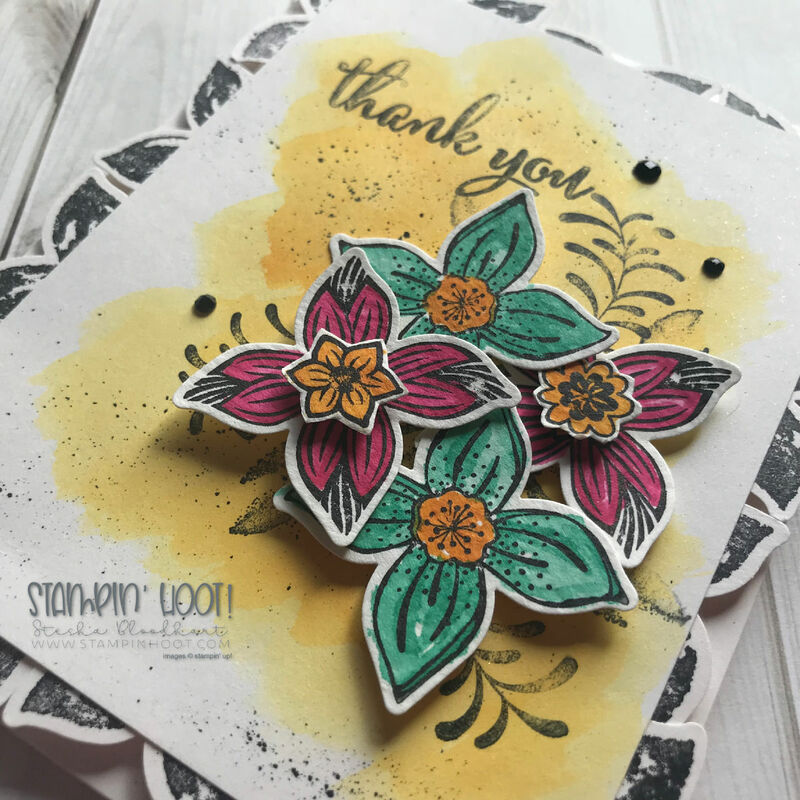 Adhere to the card base with Stampin’ Dimensionals. Stamp the remaining 4 petals in Jet Black StazOn onto Shimmery White Cardstock. Crop with the Four-Petal Flower Punch. Color with an Aqua Painter and the following classic ink colors: Mango Melody, Melon Mambo, & Coastal Cabana. Adhere with Stampin’ Dimensionals. Stamp the 3 flower image in JetBlack Stazon onto Shimmery White Cardstock. Snip the two smaller images with a Paper Snips. Color with Mango Melody Ink and an Aqua Painter. Adhere to the center of two flowers with Mini Stampin’ Dimensionals. Add 3 Black Faceted Dots for the final touch. When creating a watercolor wash background, be sure to follow a few steps to ensure you can a nice even coverage of ink (no dark ink spots). First, apply water only from your Aqua Painter. Not a lot, just a small squeeze and make sure you keep it in the area you want to cover. This creates a map for the ink to follow and spread, ensuring you do not have a dark ink blotch where your Aqua Painter first touches the paper. Keep a paper towel close to dab excess water from both your Aqua Painter and the Shimmery White or Watercolor Paper. Stampin’ Dimensionals are a MUST in my craft room. I continually create cards with dimension and Stampin’ Dimensionals make that dimension come to life. I also need my Aqua Painters…I love the soft watercolor look that Aqua Painters help to create and my style wouldn’t be what it is without them. What is your must-have item in your craft room? Stamp & Punch bundles ensure quick and easy cards or crafts with dimension. I know that fussy cutting is not for everyone, even though it is a therapy for me. I thrive on a fussy cut card. If you are not big on fussy cutting and don’t want to get out a Big Shot Die-Cutting Machine, then punches are the way to go. Stampin’ Up! has stepped up their offering on punches that coordinate with stamps. Pop of Petals is one of them. Pop of Petals Bundle by Stampin’ Up!